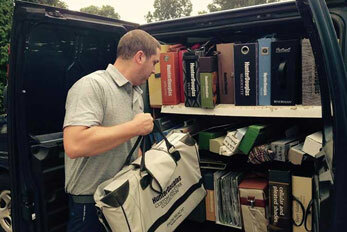 Shades On Wheels brings the blinds, shades, shutters, and draperies showroom to you! Create a custom window fashions look using a combination of shades and drapes. 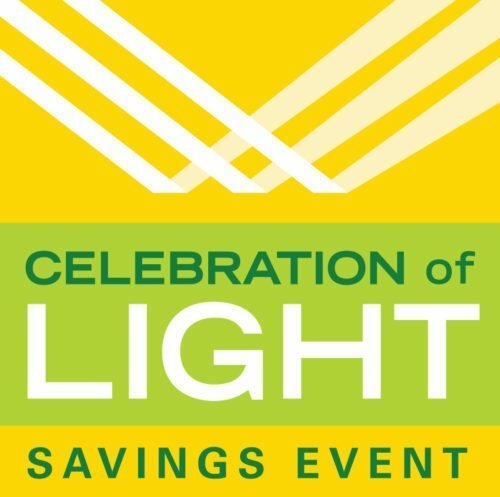 Save on energy bills. Control your shades by iPhone, Tablet or Android device. Plantation-Style Shutter made with dovetail construction for maximum strength & durability. Shades On Wheels has a HUGE selection of paint stains, slat sizes and colors. 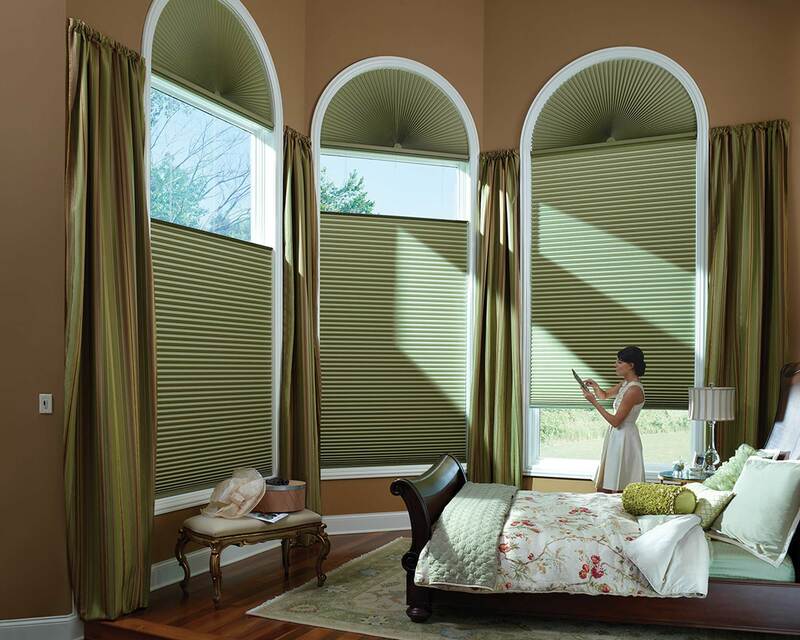 From Simple to Sophisticated, Shades On Wheels can make any kind of window treatment. CALL NOW to schedule a FREE in-home appointment. 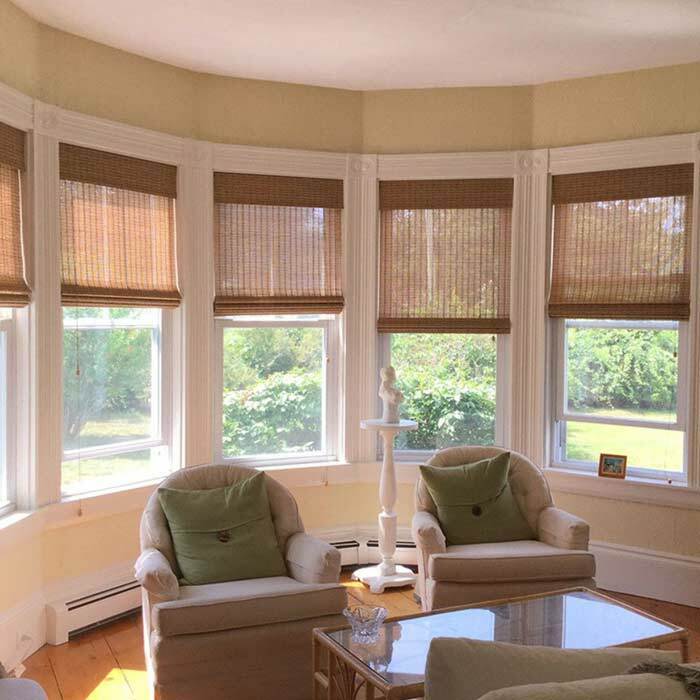 Are you looking for a professional custom window treatment or custom window drapery dealer in the Massachusetts or Connecticut area? 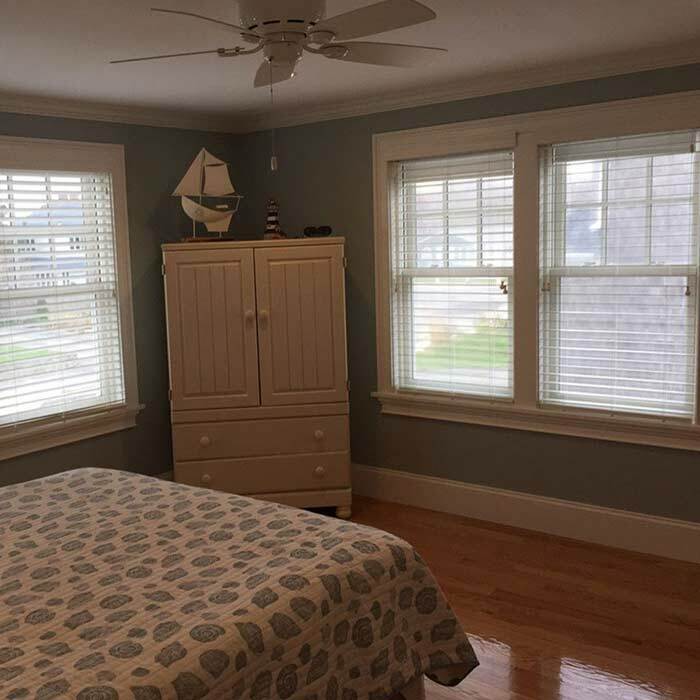 Serving residential and business customers throughout Massachusetts and Connecticut for more than 30 years, Shades on Wheels are the experts when it comes to covering your windows with custom window drapery, shades and shutters. Contact a Shades On Wheels at a location near you in Norwell, MA, Medfield, MA, Agawam, MA, Wethersfield, CT and surrounding areas. Shades on Wheels offers free measuring and installation on all our custom window blinds and custom window shades, custom window shutters, custom window drapes and more. We bring the showroom to you so you can conveniently shop for custom window coverings, custom window treatments and fabric draperies in the comfort of your own home or office. At Shades on Wheels, we understand our customers lead busy lives, which is why we arrive at your location ready to help you select the right window shades, blinds or custom drapery to fit your exact window specifications. Containing exquisite fabrics in vibrant colors, our luxurious collection of custom window blind samples are designed to perfectly complement your existing decor and lifestyle. Designed with the most efficient lifting systems available, our motorized custom window blinds and custom window shades are controlled by remote control, hard-wire switch or iPad & Android apps. 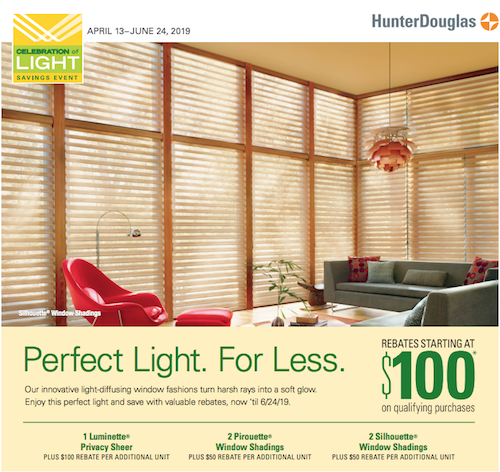 Hunter Douglas window shades and blinds are on sale now at Shades On Wheels for a limited time this spring. Create the perfect light in any room for less with great rebates on sheer Hunter Douglas window shades. Transform harsh sunrays into a beautiful glow this spring and summer with light-diffusing Hunter Douglas window shades. We all look forward to the warmer weather here in Massachusetts and Connecticut. When the sun streams into a room it can create glare. Turn your room from glare to glow this season with Hunter Douglas light transforming custom window shades and blinds. Contact Shades on Wheels for more information. Introducing the new Hunter Douglas LightLock™ System! 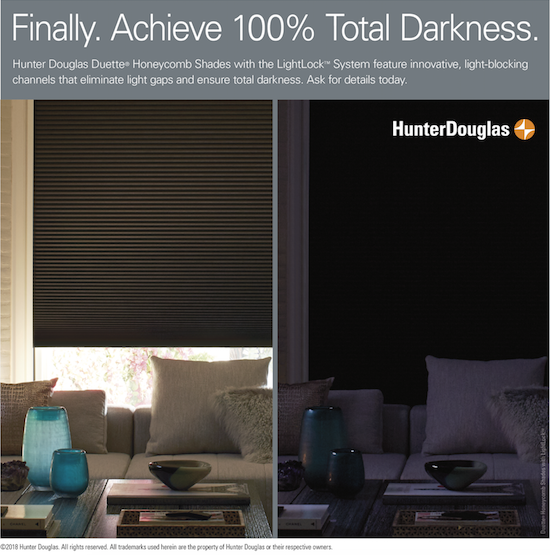 Hunter Douglas Duette® Honeycomb Shades with LightLock™ eliminates light gaps, which ensures total and complete darkness. The micro-ridges in the U-shaped channels block any outside light seeping into your room. Perfect for both bedrooms, living rooms, and media rooms, where blackout blinds are always desirable. 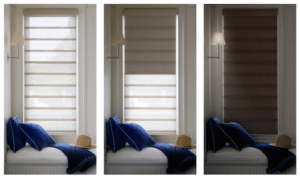 The ultimate blinds that offer both room darkening and window insulation year round. Hunter Douglas Duolite® system seamlessly integrates a light-filtering and a room-darkening fabric in a single shade. Combine Duette® Duolite® and LightLock™ to create the ultimate window treatment. A window blind that is energy efficient can filter natural daylight and also block light out entirely. PowerView® Motorization is the most innovative motorized blind technology in the window treatment industry. The PowerView® Hub & Reconnector recently won the Red Dot design award. 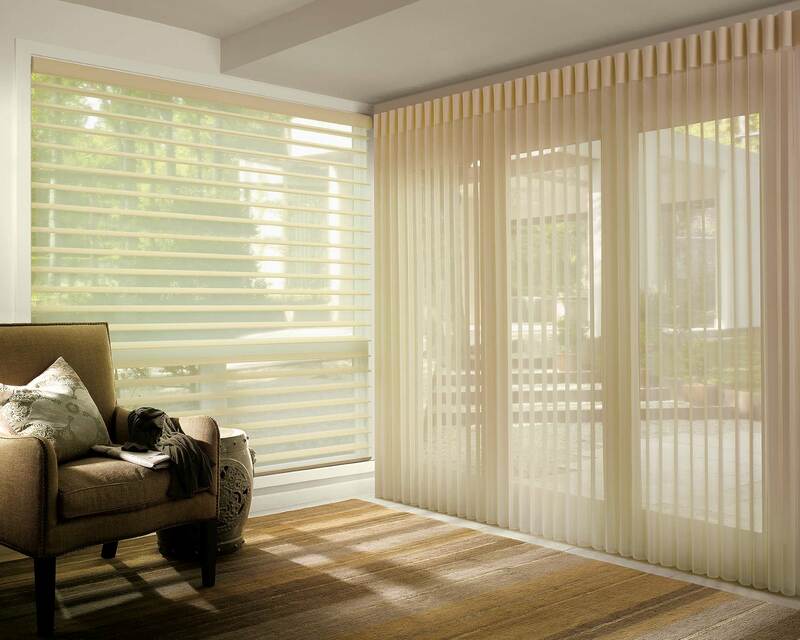 The technology of Hunter Douglas motorized blinds and shades is superior. Operate all the window shades in your home or office simultaneously. Control all your window shades and blinds using your favorite mobile device. iPhone, Android, tablet and the Pebble® remote control are just a few ways you can easily raise or lower your window shades. Set your shades to move at specific times of the day or night based on your schedule. The motorized blind and shade technology is so intuitive you can use your home speaker devices to control your window treatments. Just use a simple voice command with Alexa or Google Home to open and close your blinds from any room of the house. Control the light and privacy in your home! Hunter Douglas Duolite® is the perfect window shade to control the light or have privacy. The Duolite® two fabric system design is available on Hunter Douglas Vignette® Modern Roman Shades, Silhouette® Window Shadings, and Duette® Honeycomb Shades. It’s two window shades in one so you can softly diffuse natural sunlight and have room-darkening capabilities to create the perfect atmosphere. 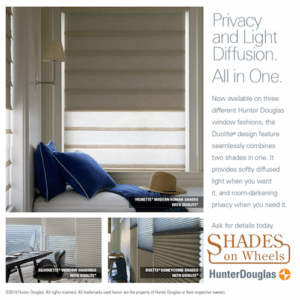 Shades On Wheels will bring the latest Hunter Douglas blind and shade fabrics samples to your home or office. New colors, textures, and fabrics are available on Hunter Douglas Duolite® shades so you can coordinate your new window treatments with decorative elements within your space. 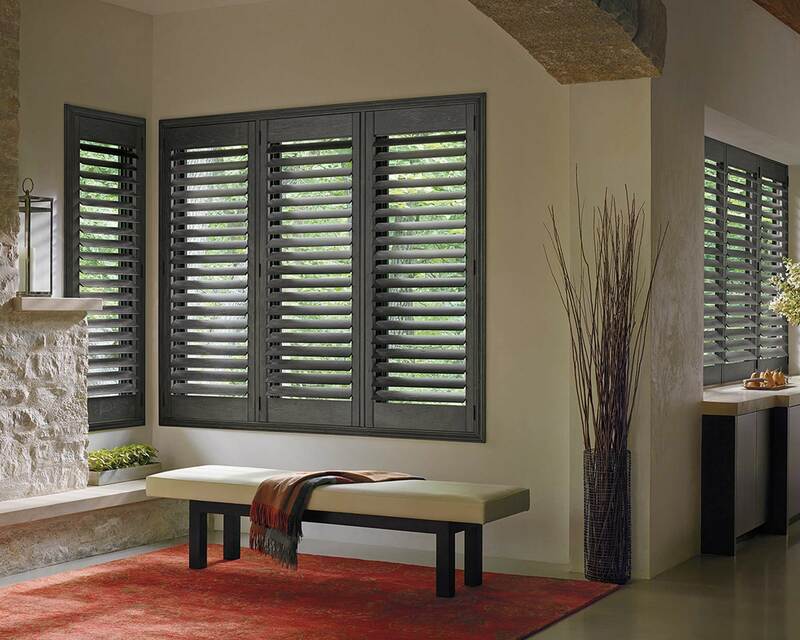 Whether you just moved into a new home, starting a design project or renovating your home or office, Shades On Wheels can help you put the finishing touches on any room with the best Hunter Douglas window treatment, custom blinds, window shades or wood shutters. Custom draperies and top treatments can be added to any Hunter Douglas window fashion for a complete window coverings look. The Duolite® design feature seamlessly combines two shades in one! Contact Us to schedule a free in-home design consultation or call 1-800-462-5133 to find a Shades On Wheels window treatment specialist near you in Massachusetts and Connecticut. Suzi was great. She worked with us to figure out our needs and wants and was very prompt. I would highly recommend Barbara Thomas and Shades On Wheels. After doing an addition on our home 10 years ago, I had a lot of windows I needed to cover! Barbara came out to our home and patiently went over the samples with me. I was able to see the quality and colors of the products I was choosing right in the rooms I would be using them in. 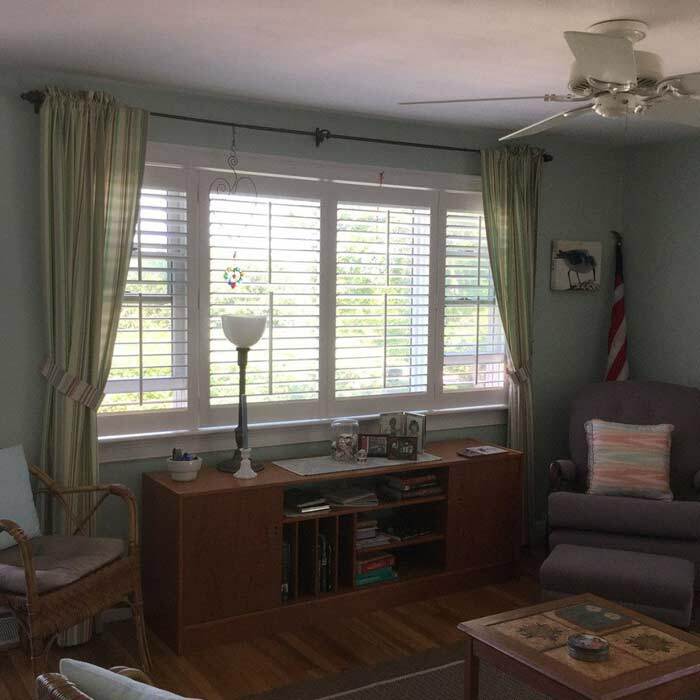 Now this past summer we moved to a new home and I called Barbara again and selected beautiful plantation shutters for my windows. The installers have worked with Barbara for 20 years and were professional and efficient getting the job completed. I LOVE my new window treatments and will refer my friends to this business. I am so pleased with my woven shades from Suzi Garrity/Shades on Wheels! Prior to her visit I had the idea of a dark color in mind. After reviewing the choices with her, she gently suggested I consider a lighter color. I couldn’t be happier with the results. I’m so glad I went with the lighter color. In addition, she was able to accommodate my request for an unconventional outside-mount application and my windows look larger because of it. The installation went very smoothly as well. It was so convenient to make an appointment and see how the colors looked in my home with my decor and lighting. I would highly recommend Suzi and Shades on Wheels. Barbara was wonderful to work with! This was our 2nd time and both times were stress free. Wouldn’t hesitant to call for future work. From personally assisting us at home with window treatment selections on almost all of our windows the very first week in our new home MANY years ago, to updating and guiding us with professional suggestions as the years have gone by, to standing behind every product, Barbara has provided our family with outstanding and warm service, always assuring complete satisfaction every step of the way–we cannot recommend her highly enough. 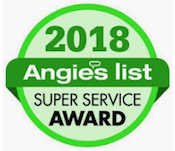 She is on our carefully curated “go to” list for best in service. Woo Hoo Shades On Wheels! We are very happy with our entire experience with Shades on Wheels! Barbara instantly understood the look we were interested in and guided us to specific colors and products to achieve that look. The installation process was seamless. Very professional and clean. We will absolutely use Shades on Wheels again! This is the 3rd time I have used shades on wheels. Love the variety of window treatments, the in-home service and the complimentary installation. Such a great company. I had just done some renovations and wanted new window treatments. I am a huge fan of Hunter Douglas and contacted Shades on Wheels. I was most fortunate to work with Barbara Thomas who was fantastic! She was most helpful, knowledgeable and personable and worked with me to get the effect I was looking for. Her installers were also wonderful which made the whole process a most pleasant experience. I highly recommend Shades on Wheels! Barbara delivers a superb product in the end! Throughout the simple process provided extensive product knowledge, excellent design ideas and ultimately assisted me in making my selection. My husband and I think they are gorg. does anyone that stops by. Barbara’s team of installers were great. In and out in no time. Working with Suzi from Shades On Wheels was a delightful experience. Our 3 projects were done within budget, on time, with incredibly beautiful results. She surpassed our expectations. Clients and visitors alike have commented on our new blinds and window treatments and we have already passed Suzi’s name on to several people. Excellent experience with Suzi . Will definitely call her again when we need shades. Love the house call!! 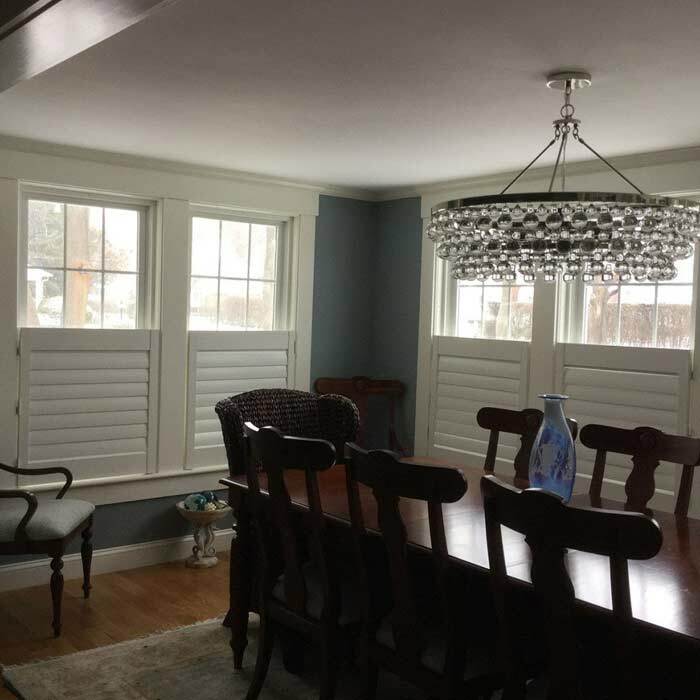 We were very pleased with shutters we ordered for our family and dining room areas. They were ordered and delivered and installed in a short time and were reasonably priced. I would highly recommend them to anyone. I had three window treatment consultations for our new home. I am so glad that I called Suzi when I received the flier in the mail for shades on wheels. We could not be happier with our treatments. Suzi did a great job in working with us to make sure that the treatments were the aesthetic I was looking for but also functional. The quality of Hunter Douglas is unmatched, and they have a lifetime warranty! I expected the price to be a tier above the budget businesses we evaluated but that was not the case when all is said and done. We could not be happier and Suzi was an absolute delight to work with! Very pleased with the products I received from Shades on Wheels. Barbara spent time helping me pick out types of shades and draperies for my condo and greatly assisted with color schemes. Extremely satisfied with the installation people who went out of their way to get it right; including taking products home to tweak them just right for proper fit on the windows. Suzi gave me ideas and helped me choose the best window treatments for our new space/room. She came on-site with a good variety of different types of her product. Suzi is well organized, professional, and very pleasant to work with. 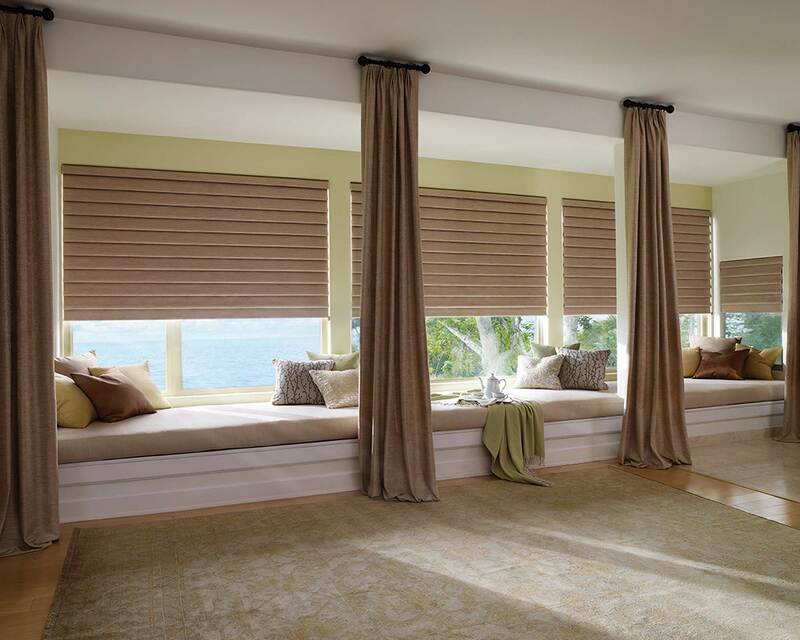 I would not hesitate to call Shades On Wheels again for any future window treatments we might need. For a mini-makeover in our guest room, we got rid of heavy custom drapes and selected four beautiful Hunter Douglas Sonnette roller shades. Suzi guided us through the selection process mentioning all of the pertinent details to help decide what would look best and stay within our price points. The shades were delivered and installed on time. The shades make all the difference to the makeover! Excellent, thorough, timely, and professional. 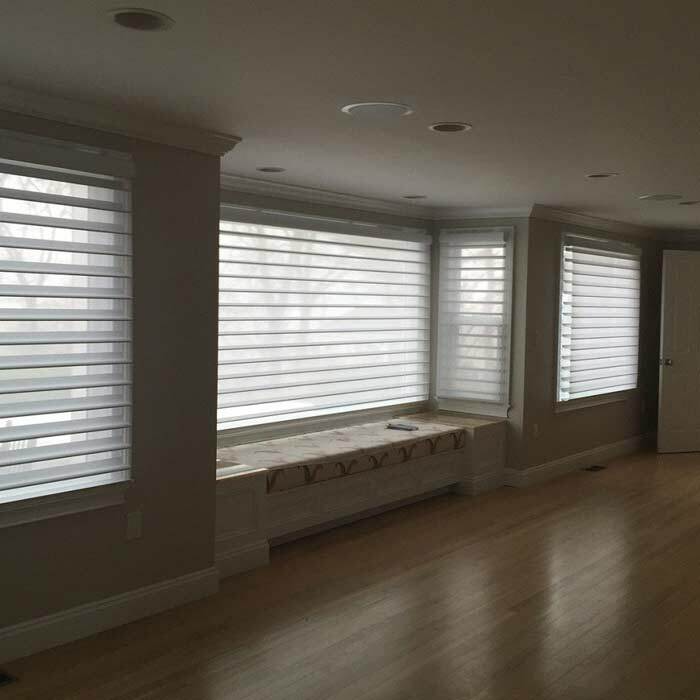 We worked with Barbara at Shades on Wheels to select blinds for several rooms in our new home. Her knowledge and experience were very helpful, and her ability to understand and respond to our thinking was appreciated. The installers were also great – on time, courteous, competent, and efficient. 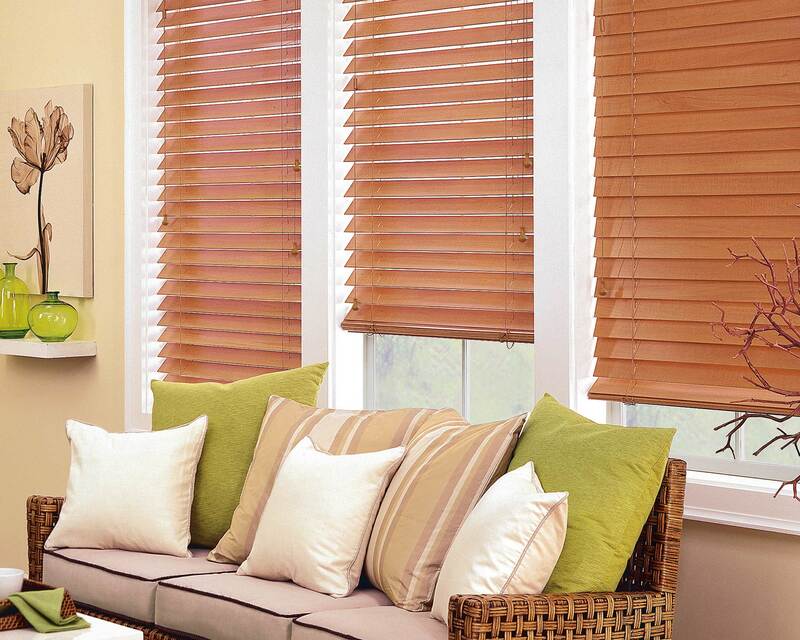 We would certainly recommend Shades on Wheels, and will call Barbara when we are next wanting window treatments. Thank you. Extremely pleased with the Customer Service from Shades on Wheels. Andy Osgood was patient while I made my choices for my kitchen and dining room, and was very informative and helpful. Suzi was incredible! She made it all so easy and she has excellent taste. Suzi helped us to pick the perfect fabric, color and styles. I’m usually completely overwhelmed by design choices, but Suzi made it painless – and fun! We will use her again on future projects. We recommend her highly. Shades on Wheels expertise figured out which product was best, selected the perfect color and installed the application exactly when promised. Would definitely use Shades on Wheels for next project. Our experience from beginning to end was wonderful. Suzi came up with the best choices for our windows.The Designer Roller Shades and Woven Woods are beyond the quality we had hoped for. Installation was a breeze. They look beautiful in our home and we have receive many compliments on both. Shades on Wheels will not disappoint! Suzi was great to work with and had perfect suggestions. I would absolutely use shades on wheels again. I highly recommend Suzi. She helped me with my first project when we moved and I had no hesitation to call again for a second project. Suzi takes the lead from start to finish, making the entire process so easy. The most challenging part was trying to decide from so many great choices! Suzi came in with great ideas to get us started, and evolved with us as we figured out what we wanted for the space. She helped us visualize what different options would look like and explained what effect they would have on the room and how certain styles might be better for how we like to live. She was such a pleasure to work with, and we are so happy with how our shades turned out! I can’t wait to work with her again! Not my first time using shades on wheels and won’t be our last. The quick turnaround on our custom shades and the efficient installation crew just capped off another great experience. Suzi Garrity was great, both accomodating and helpful throughout the entire process, providing me with all of the options available for my french doors. She was very knowledgeable of the product line and helped me choose the right shades for my space. It was a pleasure to work with her and I would highly recommend her and Shades on Wheels. Shades On Wheels came to my home and did a free window treatment consult. They helped me select the right window shades to go with my decor. Barbara at Shades On Wheels was wonderful. She had her team measure and install my shades perfectly. I highly recommend Shades On Wheels! As a designer, Barbara is my go to person for windows. She is wonderful to work with at all stages of the project: in the beginning when deciding on a treatment, during the measuring and and ordering process and with installation. She has fabulous taste and has so much experience that I value and trust her opinions. I’ve worked with her on many projects and have been completely satisfied with all of them. Shutters and woven wooden shades. Suzi listened to what we had in mind re: window treatments for our guest room. She provided several options to evaluate, showing samples of various styles. Once we selected a style, Suzi showed us multiple color options. She gave us input throughout the process. The installation was completed with no issues. Totally professional, from start to finish. Suzi was a pleasure to work with and she followed up after installation to ensure our satisfaction. We highly recommend Shades On Wheels. Barbara came highly recommended to us. I received a couple of quotes and Barbara’s prices were fair and customer service and the finished product were outstanding. Barbara measured our entire home and had prices to us in less than 2 hours! I’m extremely fussy and couldn’t have been happier with Barbara (the consummate professional), her prices, product and installation. I have already recommended Barbara and would surely use her again!! It doesn’t get any better!! Barbara and her installers were amazing to work with!! Barbara came out the same week I contacted her to measure and discuss the best plan of action for my window treatments! She was so easy to work with and had great suggestions! Hear measurements were spot on and her installers were there at exactly 7am when they were scheduled to be!! Her installers were courteous respectful and fast when installing! I am looking forward to having Barbara back soon to help with the rest of my window treatments! After building my house in 09/10 I found Shades on Wheels and was lucky enough to work with Barbara. She helped me with everything since I had no clue on style or decor. Since then I have used her services for several other projects at home and at my place of work. From simple blinds to power shades she has been able to offer all types of ideas and solutions for any challenge. Thanks Barbara and here is to working with you even more in the future!! I heard about shades on wheels from a flyer we received in our mail after we moved into our new house. I liked the idea that they will come to us in our home instead of us going to a store. I decided to call Barbara to set up an appointment and left a message. She happened to be away in vacations and still took the time to call me back the same day to set up a date to come to our home. I call that great customer service!! Then she came to our house and was so nice to work with. She took all the time we needed, brought many sample from her car so we were able to visualize at home with a much better perspective! Everything was clear and easy, she took the measurements of all our windows, and couple of weeks later, as promised, two gentlemen came and installed all the shades in less than an hour, leaving no mess behind. I have to say, that was a great experience and we love our new windows treatment!! I still have my office space to renovate and I can’t wait to call Barbara back and work with her again!! Shades On Wheels is a Hunter Douglas Priority Dealer certified to professionally measure and install your window blinds and shades. Hunter Douglas window shades and blinds are the highest quality window treatments available in North America. Shades On Wheels window treatment experts will guide you through the process of choosing the best window coverings to meet your needs. From ease of operation to choosing exquisite fabrics and patterns, we’ll work with you to select a window treatment that suits your lifestyle and decor. From residential blinds and shades to commercial window treatments, Shades On Wheels has the perfect window treatment solution to meet your home or office needs. 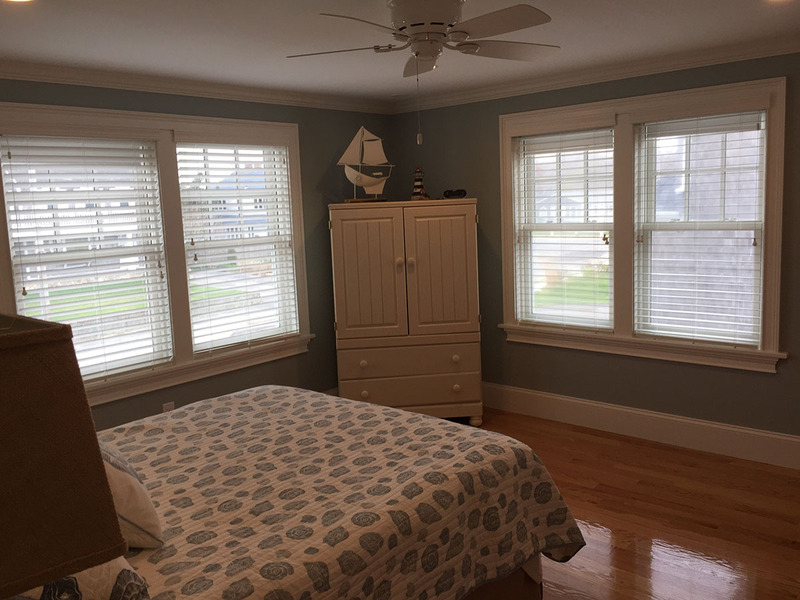 "I hired Shades On Wheels to change window treatments for my son's room to improve darkening, ease of use, insulation and aesthetics. Suzi Garrity arrived promptly, included my son in the discussion, and had lots of samples to choose from on site. As promised, I received a phone call regarding delivery and installation. We are beyond happy with the results. Every process should be this agreeable and easy! "Wonderful experience from start to finish! 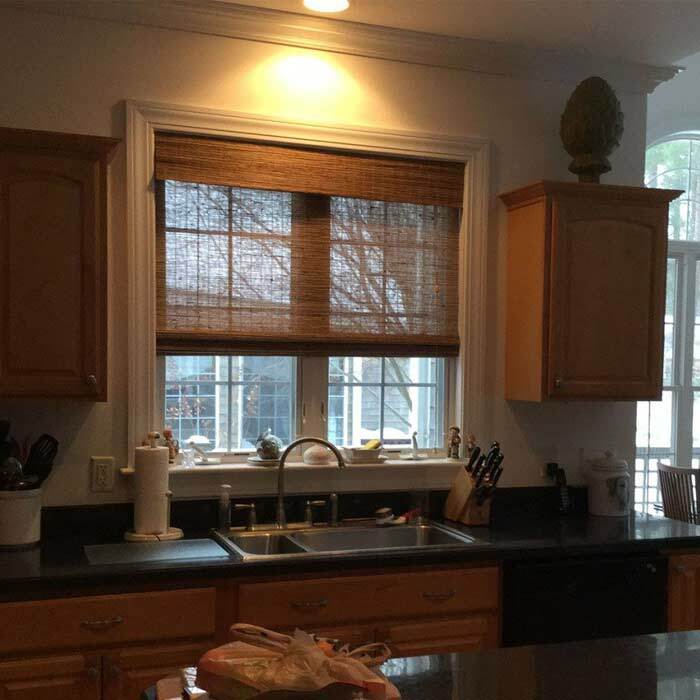 I contacted Suzi at Shades On Wheels to help us outfit our new home with Hunter Douglas Duette honeycomb shades. 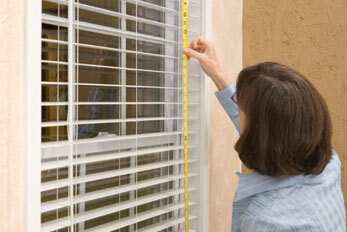 Suzi met me at our new home and quickly and efficiently measured 25 windows! She helped me choose the best color and texture options for our home. I received a call a couple weeks later to set up the installation and our new shades were perfectly mounted a month after they were ordered. We are thrilled with the look and quality of his particular product!" So happy with my new shutters! Barbara was amazingly helpful, the consultation was quick and efficient but extremely informational. She brought all her samples and explained all my options and gave us a very reasonable quote. The installation happened just two weeks later and couldn't have gone more smoothly. I am so happy with the end product, I can't thank the Shades on Wheels team enough! !